Digital planning of implant therapy ensures predictable and successful treatment by allowing clinicians to visualize the surgical procedure before they perform it. With this goal in mind, this book lays out the latest research on implant dentistry as well as effective case presentations to demonstrate cutting-edge imaging and surgical techniques. Readers are guided through the process of using digital tools at every stage of treatment, from developing the treatment plan to surgical execution. The authors detail the specifications of guided surgical procedures, review the latest 3D radiology options and software currently available, and present full case studies with stunning photographs. 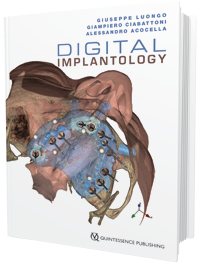 As implant dentistry relies more and more on digital technology, clinicians owe it to their patients to educate themselves on the most current tools available, and this book is the perfect place to start.